UPDATE: Intel has officially announced their Intel Core-X Series processors. More details here! The Intel Core X series family was detailed yesterday but know we know about their secret sauce that will give them an edge over AMD’s Ryzen Threadripper processors. Featuring up to 18 cores, the Intel Core X processors will be the fastest HEDT processors featuring Intel’s 14nm process and some of the fastest clock speed on high core chips. 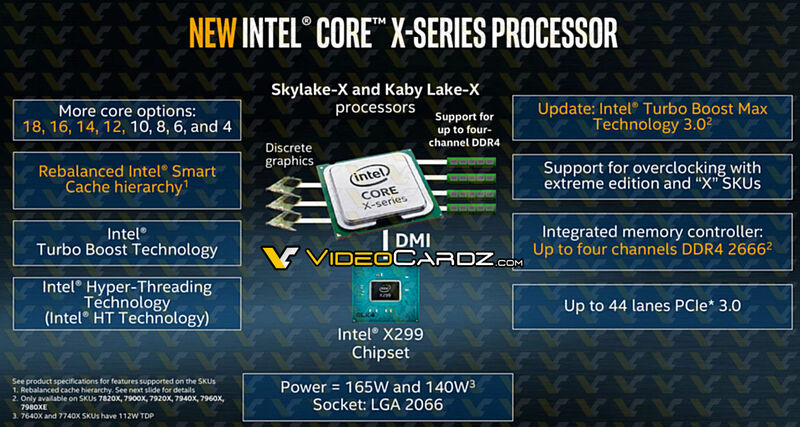 By know, you must be well acquainted with the Intel Core X series of processors that features up to 18 cores. It’s an entire range of processors housing the Skylake X and Kaby Lake X family of CPUs in the LGA 2066 socket. The SKUs range from 4, 6, 8, 10, 12, 14, 16 core options and there’s a wide list of options to select from as compared to AMD Ryzen platform. The Ryzen HEDT platform separates itself in mainstream and high-end categories. Unlike Intel, AMD buyers will be only able to purchase a chip with more than 8 cores for their X399 platform while Intel users can gain benefits of the high end X299 platform by paying for a lower core and lower cost chip. This will allow a decent upgrade path for them in the future when they wish to purchase a higher core count chip for the platform. Regardless, the Intel CPUs will boast a refined 14nm process node that delivers the fastest clock speeds we have seen on an HEDT platform. That’s also where Intel has their latest secret sauce technology coming from and boy oh boy, it’s gonna shake up the gaming performance in Intel’s benefit by a lot. Intel’s Turbo Boost Max 3.0 further refines this technology and delivers even higher boosting frequencies. We are talking about greater than 4.0 GHz and even up to 4.5 GHz on the Intel i7-7980XE 18 core behemoth. 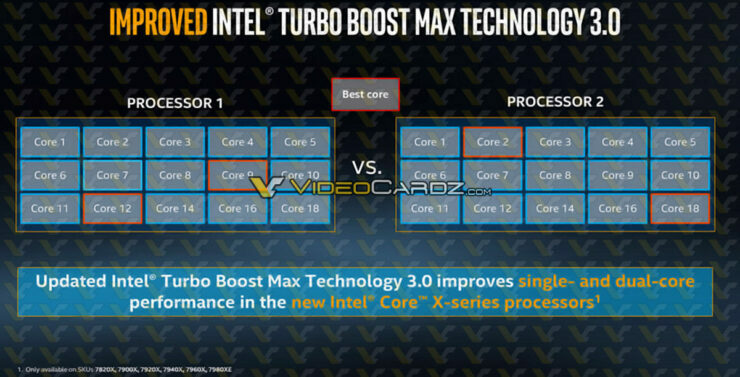 What the Turbo Boost Max 3.0 tech does is select from a single or 2 best cores from the chip and boost them to insane clock speeds for faster single and dual core performance. How that will effect workloads? Well, if you don’t know, most of the AAA games we play these days aren’t multi-core optimized and run better on faster clocked chips instead of those with higher core counts. That’s one reason the Intel Kaby Lake lineup which features just 4 cores and 8 threads is on par or better than AMD’s Ryzen 7 1800X 8 core, 16 threaded chip in gaming. We have a new flagship and it’s a monster in raw specifications. The Intel Core i9-7980XE is Intel’s fastest and also the worlds fastest chip, featuring 18 cores, 36 threads and lots of cache in the new rebalanced Intel smart cache hierarchy system. We are looking at 24.75 MB of just L3 and 18 MB of L2 cache which totals 42.75 MB, that’s impressive. The TDP we are looking at is also higher at 165W but in return, we will be looking at some really high clock speeds thanks to Turbo Boost Max 3.0 technology. There’s full overclocking support, massive 44 PCIe Gen 3.0 lanes and full support for overclocking. This monster is the highest core chip we will be getting this year for any HEDT platform and that will definitely come at a really high price point. The Intel Core i9-7960X is the direct answer to AMD’s 16 core Ryzen threadripper chip. It comes with 16 cores, 32 threads and features 22 MB of L3 cache. This chip will be featuring a TDP of 165W and will be priced over the $1000 range but it will be interesting to see how this chip competes against AMD’s highest core count chip, the rumored Ryzen Threadripper 1998X. Intel will have to compete in terms of both price and performance but looks like their chips will definitely have an edge with new clock boosting technologies on Skylake X.
Intel Core i9-7940X – 14 Cores, 28 Threads, Do You Need Any More Than That? The Intel Core i9-7940X is a 14 core, 28 thread chip which just blows away anything that we have seen so far. 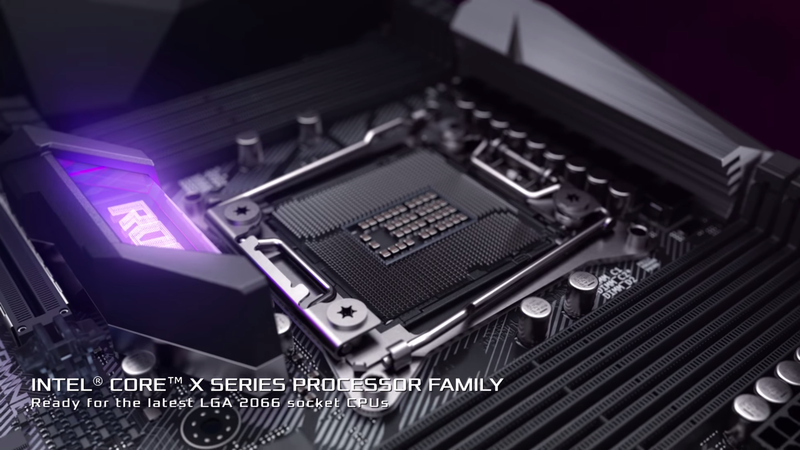 It features even more cores than the Core i9-7920X which we previously thought to be the flagship chip. Intel is definitely going to bring a very heated battle against Ryzen Threadripper CPUs. The chip will feature 19.25 MB of L3 and 14 MB of L2 cache which accumulates to 33.25 MB cache. The Intel Core i9-7920X is no longer the flagship of the Skylake X range, but it’s still a fast chip. This chip is a juggernaut featuring a total of 12 cores and 24 threads. The total cache on this behemoth is 16.5 MB (L3). Skylake X CPUs will feature a LLC (Last Level Cache) of 1.375 MB (L3) per core and MLC (Mid Level Cache) of 1 MB (L2) per core. So the total cache each core will be able to access is 2.375 MB. So theoretically, we are looking at 28.5 MB of total cache available on the chip which is part of Intel’s rebalanced cache hierarchy that not only is going to save space, but also deliver faster performance to improve IPC. The chip will ship with a TDP of 140W (not 160W as previously indicated) and will feature a quad channel IMC allowing for up to eight DDR4 DIMMs (two per channel) clocked at 2666 MHz (native). The chip will also feature a total 44 PCIe Gen 3.0 lanes which are enough for running a range of multiple discrete GPUs and fast NVMe storage devices. The chip is expected to launch in August, a whole month after the initial lineup hits the market and might cost close to $1500 US as we have seen already with the 10 Core, 20 thread pricing of Broadwell-E Core i7-6950X flagship CPU. It is also stated that Intel is working on a custom integrated water cooling solution for overclockers which will be either sold with the HEDT chips or separately. The Intel Core i9-7900X is the 10 Core, 20 thread replacement to the Core i7-6950X. This chip will come with 10 cores, 20 threads but on a new Skylake architecture. The chip will feature a total of 13.75 MB cache, that’s 1.375 MB per core. The core clocks are maintained at 3.3 GHz base, 4.3 GHz boost with Intel Turbo 2.0 and 4.5 GHz boost with Intel Turbo 3.0. That’s a vast improvement over the current models and the chip will supposedly feature good overclocking capabilities with its TDP of 140W. The chip will have 44 PCIe Gen 3.0 lanes. The chip will be aimed as a fast multi-threaded option for users who cannot afford the Core i9-7920X. It is expected to launch on June 26th for a price close $999 US or beyond. There’s a chance that Intel may give Skylake X more competitive pricing based on the fact that Ryzen 7 is already out in the market and AMD is soon going to launch their HEDT X399 processors featuring 8, 12, 16 core processors. The Core i9-7820X will be Intel’s cost optimized, under $1000 US variant. It will ship with 8 cores, 16 threads. The chip will be clocked at 3.6 GHz base, 4.3 GHz boost with Turbo 2.0 and 4.5 GHz base with Turbo 3.0. The chip carries 11 MB of L3 cache and will feature 28 PCIe Gen 3.0 lanes. This processor is going to feature a TDP of 140W. 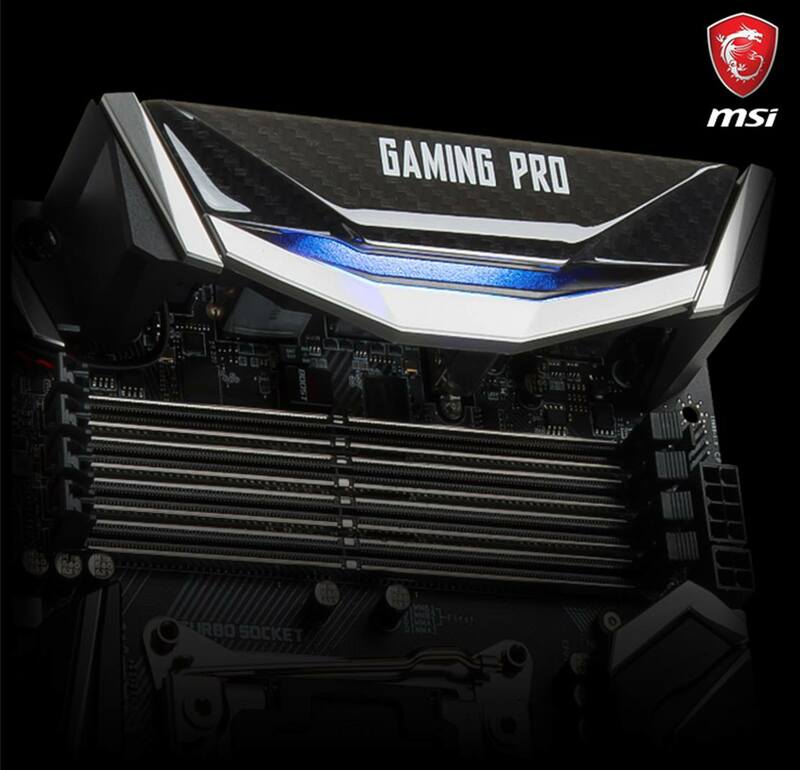 Boards such as the MSI X299A Gaming Pro will provide tons of features and up to triple NVMe PCI-e storage device support out of box. The chip will be a replacement for the Core i7-6900K which has been a very popular chip on Intel’s current X99 enthusiast platform. The chip will also launch in June and will directly tackle the Ryzen 7 1800X. Although, price wise, it could sell for higher versus 1800X’s $499 US market price.